SUGAR LAND, TEXAS (August 9, 2013) The Sugar Land Skeeters erupted at the plate scoring 10 runs in the first three innings to down the Long Island Ducks 11-3 in the first game of their current five-game series at Constellation Field in the Houston suburb of Sugar Land on Friday, August 9, 2013. The Skeeters scored four runs in the first inning and followed up with three more in both the second and third to jump out to their 10-0 lead at the end of three innings. They added an additional run in the sixth before the Ducks got on the board on a Ralph Henriquez sacrifice fly to center field; scoring P.J. Phillips from third base. They added two more in the eighth inning to close out their scoring. The Skeeters added an insurance run in the sixth inning to add to their scoring blitz. Ryan Langerhans went 2-for-3 with two runs and one RBI, while Jeff Dominguez went 2-for-3 with three runs and one RBI. In fact, six Skeeters got hits with six also scoring runs. Reid Gorecki connected for his eighth home run of the season in the first inning on a 2-1 pitch, driving the ball over the left field wall and into the Deeter Mazda Picnic Plaza. Winning pitcher Greg Aquino pitched seven complete innings, giving up one earned run on five hits while striking out four and raising his ERA to 3.58. Nick DeBarr was credited with the loss; his ninth of the season. He gave up 10 runs, nine of their earned, on seven hits, and dropped his ERA to 6.96. The Skeeters, now 71-33 for the season and 24-10 in the second half, continue to lead the Freedom Division of the Atlantic League with a one-game lead over the Somerset Patriots. In the second half, the Skeeters lead the division with a three game lead over the Lancaster Barnstormers. Game two of the current series will continue on Saturday, August 10 with a 6:05 p.m. CDT start. kick-off party on Friday evening. HOUSTON, TEXAS (August 2, 2013) Beginning on Friday, August 2, 2013 and continuing throughout the weekend, the 23rd edition of the Houston International Jazz Festival will return to the downtown area of Houston, featuring international music and jazz to soothe the needs of jazz and music aficionados. Kicking off on Friday evening, 51fifteen Restaurant in the Galleria will be the place to be for the Kick-off Party featuring the music of Sydnee-Jane and the Texas Brass Band. 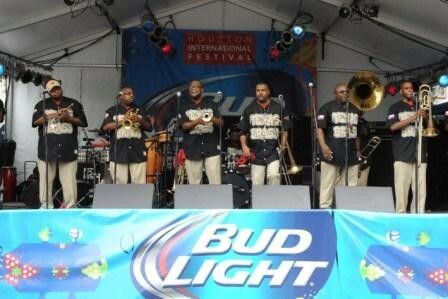 They will be joined on stage by the Texas Brass Band. The Texas Brass Band recently preformed at the 2013 Houston International Festival to rousing and enthusiastic crowds. The TBB combines the influences of jazz, hip-hop and rhythm and blues to produce a unique sound that is enjoyed by young and old alike. Sydnee-Jane will perform from 9-10 p.m. and 11:20-11:50 p.m. The Texas Brass Band will take the stage from 10-11 p.m. and againt from 11:50 p.m. to 12:20 p.m.
51fifteen Restaurant is located in the Galleria on the second floor of Saks Fifth Avenue. Tickets are $15 presale and $25 at the door. VIP and table reservations are $120 and include table and booths seating for five people. RBI in the Skeeters' 7-5 loss to Lancaster. (SUGAR LAND, TEXAS, August 1, 2013) Succumbing to three runs in the tenth inning, the Sugar Land Skeeters dropped the fourth game in a row to the Lancaster Barnstormers by the score of 7-5 at Constellation Field in the Houston suburb of Sugar Land on Thursday evening, August 1, 2013. The game was tied at four-all after nine innings when the Barnstormers erupted for the three runs to give the Skeeters their first four-game loss for the season. Sugar Land jumped out to a 2-0 lead in the first inning when Adam Godwin connected for a two-run home run, scoring himself and lead-off batter Jeff Dominguez from second base. Lancaster came back in the third inning with two runs, along with single runs in the sixth and eighth innings to tally their four runs at the end of regulation. The Skeeters scored single runs in the fourth and seventh innings to complete their four runs. Sugar Land added a single run in the tenth inning, but was unable to send any runners home for the loss. Errors hindered the Skeeters; with Dominguez, Koby Clemens, and pitcher Gary Majewski all miss-fielding balls for the three-error game. Twelve pitchers saw action in the game, with Lancaster sending seven hurlers to the mound while Sugar Land countered with five. Jason Richardson got his third win of the season for Lancaster while Gary Majewski was credited with the third loss of the season for the Skeeters. With the loss, Sugar Land fell to 65-32 for the season and 18-9 for the second half. They remain in first place in the Freedom Division, closely followed by Lancaster with a 16-11 record. The Skeeters will now hit the road for a three game series against the Bridgeport Bluefish followed by a three-game series against the Camden Riversharks. They return to Sugar Land on Friday, August 19, 2013 for a six-game series against the Long Island Ducks.